Senate Democrats on Monday blocked a key vote on a $13.5 billion disaster-recovery funding measure amid an escalating fallout over hurricane-battered Puerto Rico. Details: The massive bill passed by the House in January would allocate funding to states like Florida and North Carolina, which were hit last year by hurricanes. Senate Republicans have also added funds for victims in the Midwest affected by flooding last month. 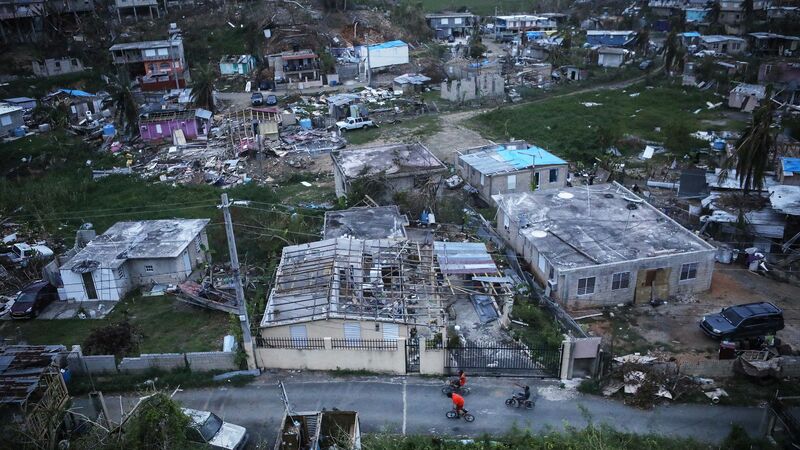 But Democrats argue that the $600 million for nutrition assistance to Puerto Rico under the bill is insufficient, and that the island is in urgent need of more funds for disaster relief and to rebuild its water system. The big picture: President Trump doesn't want to give Puerto Rico any more federal money for its recovery from Hurricane Maria, claiming in private — without evidence — that the island’s government is using federal disaster relief money to pay off debt. He told Senate Republicans at a lunch last week that Puerto Rico has already received more disaster funding than many U.S., though the figure he cited was inaccurate, the Washington Post reports. Senate Majority Leader Mitch McConnell (R-Ky.): "This is no time for our colleagues across the aisle to prioritize a political fight with the president ahead of the urgent needs of communities across our country." Senate Minority Leader Chuck Schumer (D-N.Y.): "Republicans must remember that — just as we leave no soldier behind on the battlefield — we help our fellow Americans when there’s a disaster, wherever the disaster strikes. We do not abandon them. Period." Sen. Chuck Grassley (R-Iowa): "To my colleagues across the aisle who have been spending a lot of time in Iowa lately as presidential candidates ... how are you going to look Iowans in the eye and justify a vote against moving this disaster relief bill ahead?"